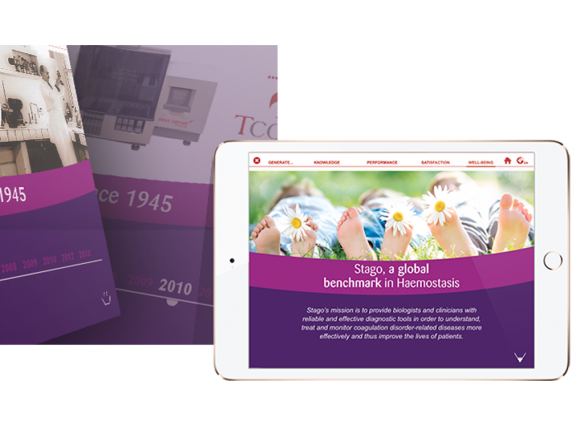 Stago is an In Vitro Diagnostic leader specialising in research of Hemostasis and Thrombosis. They manufacture reagents and analyzers for medical analysis laboratories. They are present internationally with 15 subsidiaries and sales teams around the world focusing on selling hemostasis and thrombosis products and solutions to various markets. 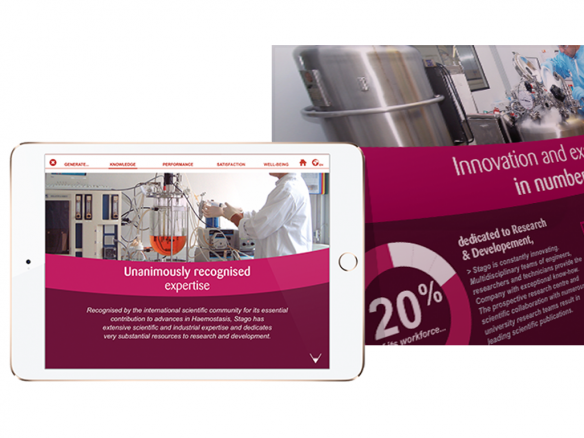 With a complex sales structure, they were searching for an innovative, agile tool to regroup and manage all their demos, presentations and sales kits in one digital hub that could develop and evolve in time. Taking advantage of a leading market technology: Next Gen application, they built a secure and private,iPad-only mobile application designed for their international sales teams in all countries. 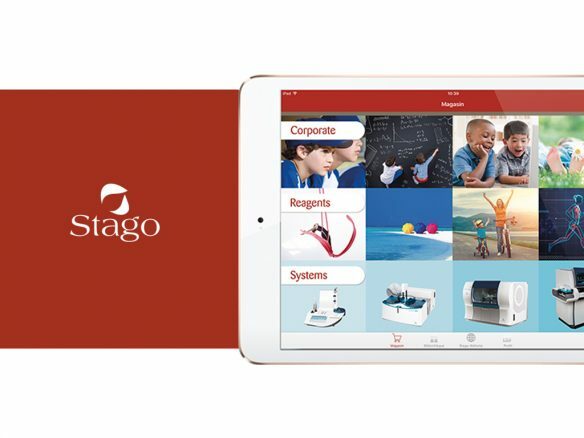 Structured to fit the internal needs (division in 3 clear app sections) and Stago branded, it is filled with engaging and visually pleasing presentations. With Rakuten Aquafadas technology the ongoing content management and production workflow has been set up in a flexible way way that varied types of documents could be included either already existing but enriched (with videos and more) or created from scratch using Indesign Plugin. And thanks to a login linked with the existing Stago’s Active Directory if offers a very exciting and useful, personalization of content served to each sales rep based on user profile stored in log-in details (contextual content serving). Marie Dumas, Digital Communication Manager. After a period of intense collaboration with Rakuten Aquafadas and internal teams at Stago, the final mobile hub is already much appreciated by sales teams. It’s easy to manage for content creators, intuitive for time-poor sales reps often on the go, who can now rapidly find documents they need: with accurate information and regional localised products, costs and market details. And to top it off it gathers all available assets in one place, even other existing Stago apps thanks to a new interesting feature: integration of 3rd party apps in the Next Gen App structure.